This is a beautifully written, strangely compelling book. It follows Nick's life in London & Barwick, his awakening as a gay man, his affairs and his life. The central theme is beauty, whether of men, or art. Nick is let down and used by all central characters, and the novel has an underpinning sense of sadness, loss and grief, whether this is death and distintegration linked to aids, the manic depressison of the daughter, or the adultery and unfaithlfulness of all couples in the novel. The boys, most of them Nick's Oxford contemporaries, all in their black and white, glanced across at politicans and people on the telly, and caught a glimpse of themselves as high-achieving adults too - they had that canny glint of self-discovery that comes with putting on a disguise. They didn't mingle unnecessarily with the girls. It was almost as if the High Victorian codes of the house, with its smoking room and batchelors' wing, still guided and restrained them. But the girls, in a shimmer of velvet and silk, and brilliantly made up, like smaller children who had raided their mothers' dresing tables, had new power and authority too. As the sunlight lowered it grew more searching and theatrical, and cast intriguing shadows. 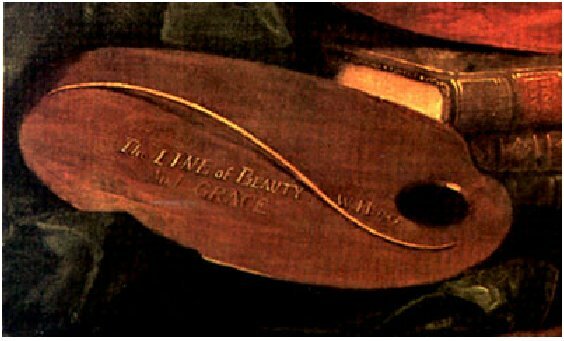 The title, "line of beauty" is a central theme in the book, and refers to a self portrait by Hogarth. The Line Of Beauty And Grace. The explanation of this line appeared only eight years later in Hogarth's book "The Analysis of Beauty" published in 1753. The line was simply to excite curiosity. The bait took soon; and no Egyptian hieroglyphic ever amused more than it did for a time, painters and sculptors came to me to know the meaning of it, being as much puzzled with it as other people, till it came to have some explanation. 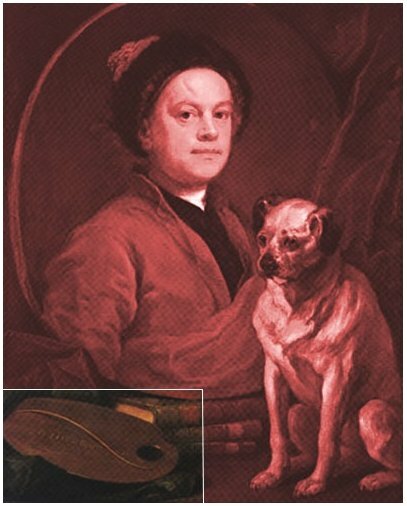 The novel's title and theme come from Hogarth, who defined a particular double curve, the ogee, as the epitome of beauty. For much of "The Line of Beauty," we dally among beautiful characters who while away their days talking about art and staying on the lookout for pretty nothings to interest or divert themselves. Indeed, Nick even quotes James on the importance of appreciating true art: "It is art that makes life, makes interest, makes importance, for our consideration and application of these things, and I know of no substitute whatever for the force and beauty of its process," Nick says, quoting from a letter James wrote to H.G. Wells. But for all their perceived culture, there isn't a whit of understanding of real art among this crowd. To understand and appreciate art, one must have a soul. "He slept there from time to time, in the fantasy of the canopied bed with its countless pillows. The ogee curve was repeated in the mirrors and pelmets and in the wardrobes, which looked like Gothick confessionals, but its grandest statement was in the canopy of the bed, made of two transecting ogees crowned by a boss like a huge wooden cabbage. It was as he lay beneath it, in uneasy postcoital vacancy, that the idea of calling Wani's outfit Ogee came to him: It had a rightness to it, being both English and exotic, like so many things he loved. The ogee curve was pure expression, decorative not structural; a structure could be made from it, but it supported nothing more than a boss or the cross that topped an onion dome. ... 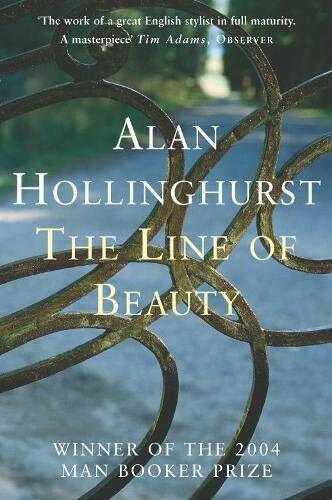 The double curve was Horgarth's 'line of beauty,' the snakelike flicker of an instinct, of two compulsions held in one unfolding moment. He ran his hand down Wani's back. He didn't think Hogarth had illustrated this best example of it, the dip and swell -- he had chosen harps and branches, bones rather than flesh. Really it was time for a new Analysis of Beauty." Happy knitting, happy reading & welcome to bookcrossing! Can't wait to read it and release it somewhere exciting. A very enjoyable and well-written book! I can't hope to match nice-cup-of-tea's erudite journal entries so I'm not going to. In the 1980s I was a socialist feminist student at Sheffield City Polytechnic, supported the Miner's Strike and hated Thatcher. Thus I don't seem to have anything in common with the protagonist in this book, who is a privileged, gay Oxford-educated man who seeks out the company of rich tories. Saying that, I was studying art history and had a fascination for the privileged bohemians of 1930s Britain. So I found myself rooting for Nick as he seems a decent cultured person despite the depravity, philistinism and greed of those around him. I feel that this book is a very clever update of the work of Evelyn Waugh, such as Vile Bodies when he satirised the "Bright Young Things" of the 1920s and 1930s. Plus, I have been thinking about the different meanings of "The Line of Beauty" throughout this book - Nick's lover's back, a line of coke, the progression of lovers through his life, the narrative of the book; I'm sure there are more. Great book - now been adapted by Andrew Davies for the BBC so hopefully will get more readers. Arrived yesterday. Thank you. I started reading the book as a bookring a few months ago, but decided that I would want more time to really read it and enjoy it.